Our 5000 litre Adblue dispenser is manufactured in our UK factory, from premium quality MDPE plastic. This Adblue dispenser comes standard with a 6m delivery hose and automatic nozzle, which is attached to a 12V pump that pumps at approx 35L/min. 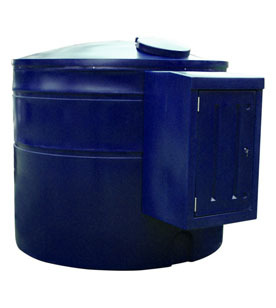 It has a unique D-shape design, which makes this 5000 litre Adblue dispenser ideal for placing straight up against wall to conserve space. This Ecosure 5000 litre Adblue fuel dispenser, has been specially designed and manufactured to dispense Adblue safely. The fittings and parts that are used, are neat and compact and it stores the hose and nozzle inside the lid for easy access. Max. flow 35L/min. Manual on/off switch. Choose 12V or 24V. Suction foot valve & strainer. 2m battery cable & croc clips. Manual Adblue® nozzle with stainless steel tip. Max. running time 20 mins.